It is a known fact that food is a basic necessity of mankind, a source of survival. From ancient times, man has been involved in finding various elements that serves as an eatable that also fulfils the criteria of being edible and safe to consume. The world today offers various cuisines that not just helps individuals survive with food intake, but also helps them treat their taste buds with unique delicacies. Apart from adapting to ways of pooling in various ingredients to cook and eat, the latest inventions have enabled us to instantly get prepared meals in the form of packaged foods that require no additional efforts of food preparation. The packaged food is often judged by the packaging quality and most importantly on the efficiency of packaging, in terms of the perfection it carries in keeping the food intact within. Why detection of leaks in food packaging is important? With the ability to detect leaks/holes as small as 10 micron in diameter, this tester comes with a unique chamber design that facilitates smooth detection without stressing on the contents in the packages. This tester has the ability to test various food items like crackers, milk powder, snack foods and salads and much more. TSE6086B is designed to fit majority of the packaged products with no hassles. The testing results are displayed in the format of pass or fail, while the system also allows you to extract information to your PC to facilitate further analysis and change test settings via web interface. 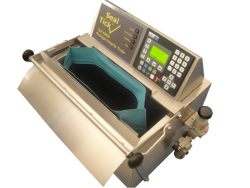 With excellent leak gauging capability, this tester can be used efficiently to test leakages in larger packaging like pet foods. Being easy to use and highly reliable, this tester can perform the testing activity in a short span of 20 seconds. Apart from indicating pass or fail the test, a quantitative number is written to the internal log that can be retrieved on PC for traceability purposes through Ethernet or USB connections. Enabling you to conveniently identify the gas-leaks in the food packaging, it works by submerging the packaging in water and then applying vacuum pressure. You will be able to notice a steam of bubbles emanating from the leakage point to the water surface. It is known to be a simple test initiation where the purpose of exact leak location is served in the most efficient manner. With this upgraded tester system you can find leaks as small as 15 micron in diameter. It can test hard packaging like cylindrical cans made of tin, composite material or cardboard. The automatic testing displays results of pass or fails along with quantitative measures of the leakage rate. This tester helps you detect very small packaging leakages of 10 micron and larger packaging leakages of 20 micron. It can test biscuits, sausage skins, snack foods and many more pillowcase packs in different sizes. Serving as a versatile testing system, you could carry out leak detection testing for a wide range of food packages. These systems serve as the most practical testing ways, to ensure your finish products reache the customers’ expecations. Using these systems will enable you to earn loyalty in terms of providing great packaging with no flaws of minor or major leakages. These instruments are the most reliable form of sources, for manual detection fails to identify invisible leakages, hindering the quality of food and brand name of the company. Owning one of these highly reliable leak testers would be the ideal solution to discover leaks in the most cost-effective way – quick and easy.